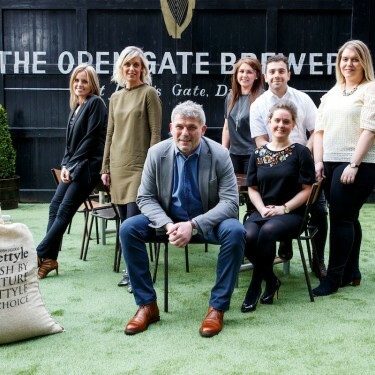 Last night, Tuesday April 4th, multi award winning meat supplier, Kettyle Irish Foods™ celebrated their new partnershipwith beer giant, Guinness® with an exclusive event in the Open Gate Brewery, St. James’ Gate. Attended by guests from every touchpoint of the food industry – from farmers and butchers to chefs, crafters and Irish food icons – host Maurice Kettyle found himself in good company as he launched the first of many combined products – the Kettyle Guinness premium beef burger. Succulent and sustainable, this mouth-watering burger marries the very best and most flavourful cuts of beef, laced with the indisputable taste of GUINNESS®, the world’s original and favourite stout. Guests of note included food mavens, Ali Dunworth and Jette Virdi, Diageo’s Declan Hassett and food bloggers Sarah Hanrahan and Niamh O’ Donoghue. Upon arrival, guests were gifted a bespoke craft apron created to especially mark the occasion before tucking into a mouthwatering four course tasting menu paired with traditional and experimental Guinness brews in the rustic surrounds of the brewery. The Kettyle Guinness premium beef burger. will be available in 2, 4, 8 and 20 packs, both fresh and frozen, to selected retailers and hospitality outlets across Ireland and Europe.